Last but not least, week 7 internship spotlights. Jordan Seibold recently graduated from Xavier University. 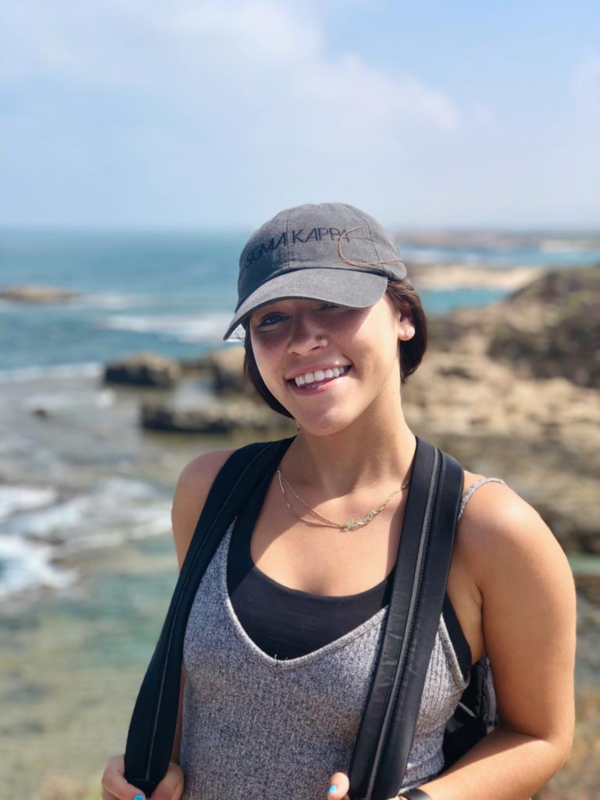 While interning in Israel, Jordan has been working in Dr. Fisher’s lab at Bar Ilan University with current graduate students, assisiting with their various projects. 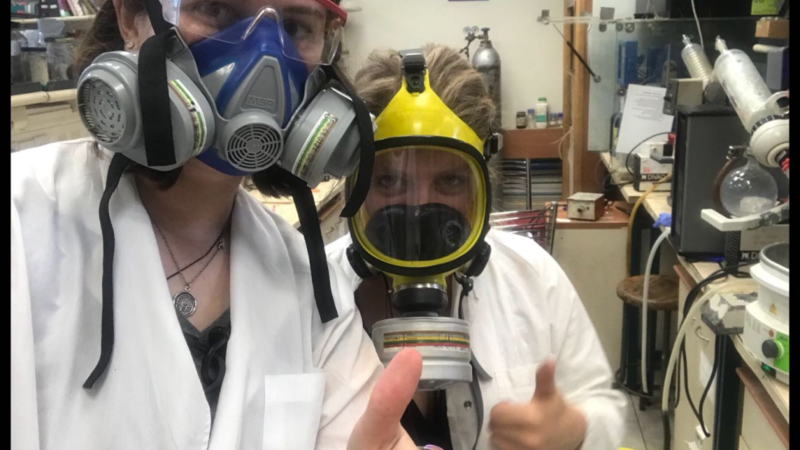 During her internship, Jordan helped with work on developing a fluorescent molecule that will be used as a breast cancer marker. Jordan says she feels like she has really learned a lot in her position and hopes her new knowledge helps her with her graduate school applications. Olivia Wolf is an incoming Junior at the Ohio State University. 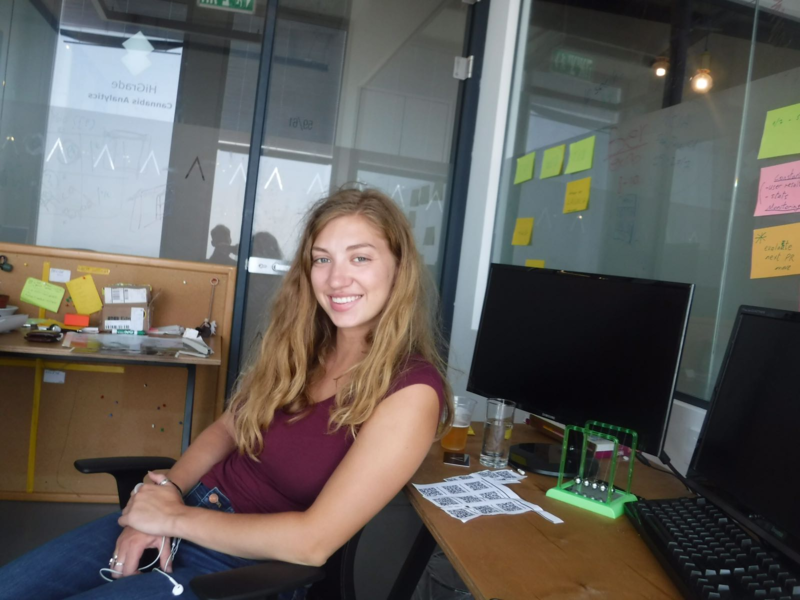 Here in Tel Aviv, she has been working for a company called HiGrade as a software engineering intern. At HiGrade Olivia helped to organize and update the code as well as add new features to the app. Olivia has really enjoyed getting to work at a small company and learn what it takes to run a successful startup. Olivia also mentioned that she has really enjoyed the panoramic view from her desk, as her office is located in the 59th floor of Tel Aviv’s tallest building. Olivia Wolf hanging out at her desk at HiGrade. Ezra Babcock will begin his last year at the University of Cincinnati this fall. Ezra has spent the last few years of college studying abroad and working in many different countries including Italy, England, and Austria. Ezra is really excited that he is now able to add Israel to the growing list of countries he has gotten to live in. 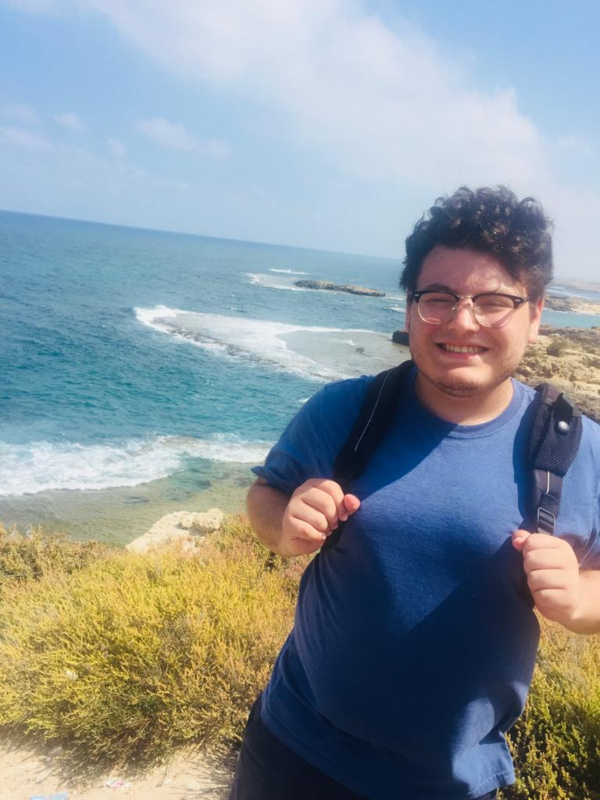 While in Tel Aviv, Ezra has been interning at the Shamoon College of Engineering as a research intern. At Shamoon College, Ezra says he did research using the overcomplete dictionaries to create a sparse representation of signals. Ezra has felt his internship was truly a great experience and especially help him with his future as he is pursuing a degree in engineering and mathematics. Ezra Babcock enjoying the sun and the beach views. My name is Mason Williams, and some of you may remember me from reading my blog posts these last 7 weeks. I recently graduated from Ohio University, where I studied Psychology and minored in Retail Merchandising and Fashion Product Development. Over the summer I have been interning at Preen.Me, a community-based product and brand discovery agency. Preen.Me works in multiple areas of beauty brand marketing, including social media. At Preen.Me I am a Content, Projects, and Marketing Coordinator, and I work to help various beauty brands including Charlotte Tilbury, Kendra Scott, and Revlon to market their products on Instagram via Influencers and bloggers. I also spent this summer as the Onward Israel Blogger, keeping up with posting weekly content about what our group has been up to. I’ve learned so much here in Tel Aviv and can’t wait to use my new skills while job searching back in the States. Mason Williams exploring in the north. This week was unfortunately the last full week for the group in Tel Aviv. We spent the week hanging around the apartment and eating at the many different restaurants near us. During the day, we all finished up our tasks and the last of our internship responsibilities. Some of us finished out the last day on Thursday, while others are finishing ours this upcoming Sunday. 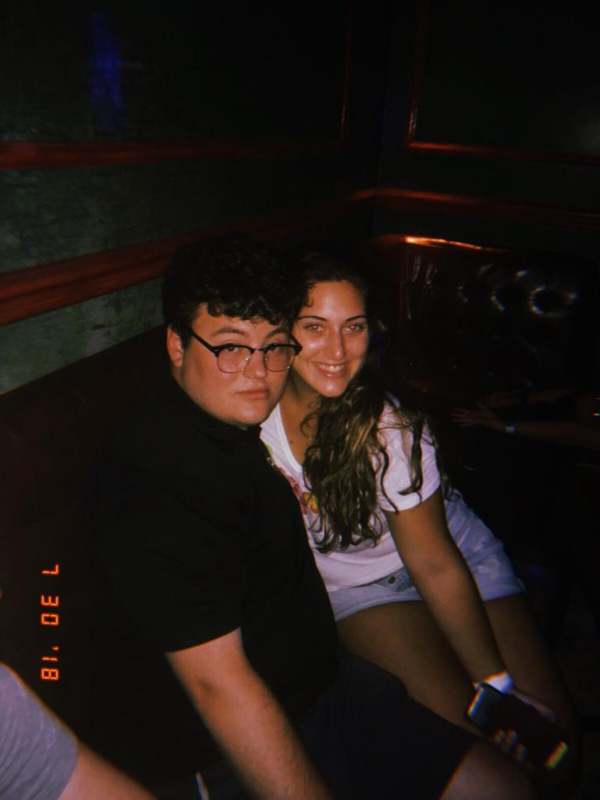 On Thursday night our Madricha, or group leader here in Israel, Niva organized one of my favorite events we’ve had on the trip, a Karaoke Night! Niva rented out a big room at a Karaoke bar called Me on the Mic on the Tel Aviv Port. We got to pick all the songs that played and our room even had a mini stage for whoever was singing. Karaoke was the perfect way for us to all unwind after a week full of working at our positions. It was also a great way for us to act goofy and joke around with each other. Susan Brownstein and Ezra Babcock cheering on other group members at karaoke night! Rothschild Boulevard, just walking distance from our apartment and where we spend many of our nights trying the amazing array of restaurants. With it being our last Friday here, we decided the best way to spend it was having a shabbat dinner together. Our Shabbat dinner was held at the beach under an extra large gazebo. We set down big blankets under it, and had a nice simple service on the beach all together. Then we finished the night with a giant home cooked meal we worked together to make. It was really special to watch the sunset all together at the beach on Shabbat and our meal was delicious too. 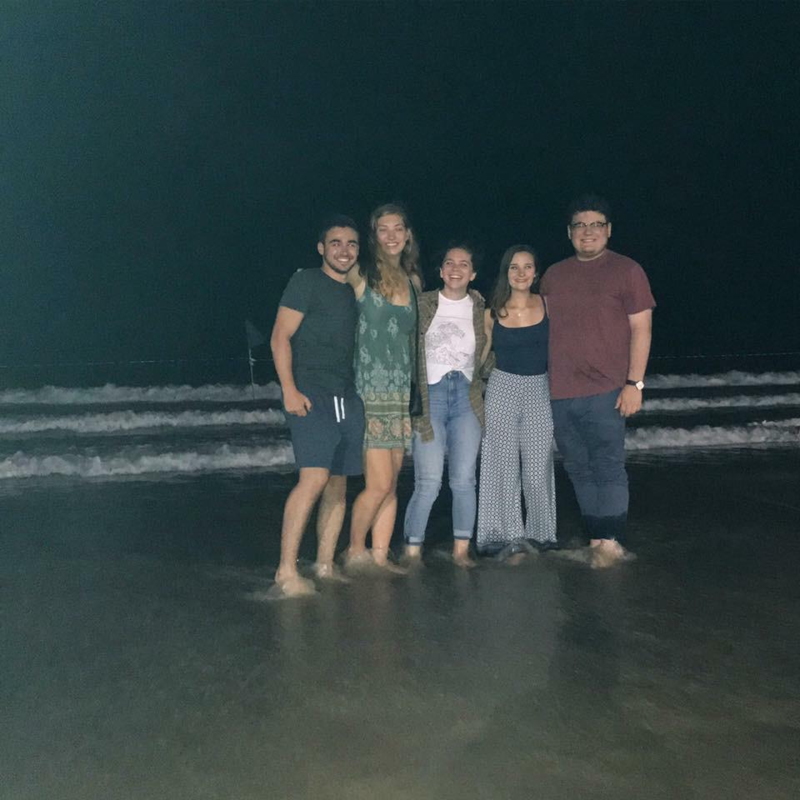 Left to right: Bradley Bolotin, Olivia Wolf, Avocet Greenwell, Reagan Heck and Ezra Babcock enjoying the water after our beach Shabbat. Another thing we made top priority since it was our final full week in Tel Aviv was making sure we got to eat all the food at some of the restaurants we love here. 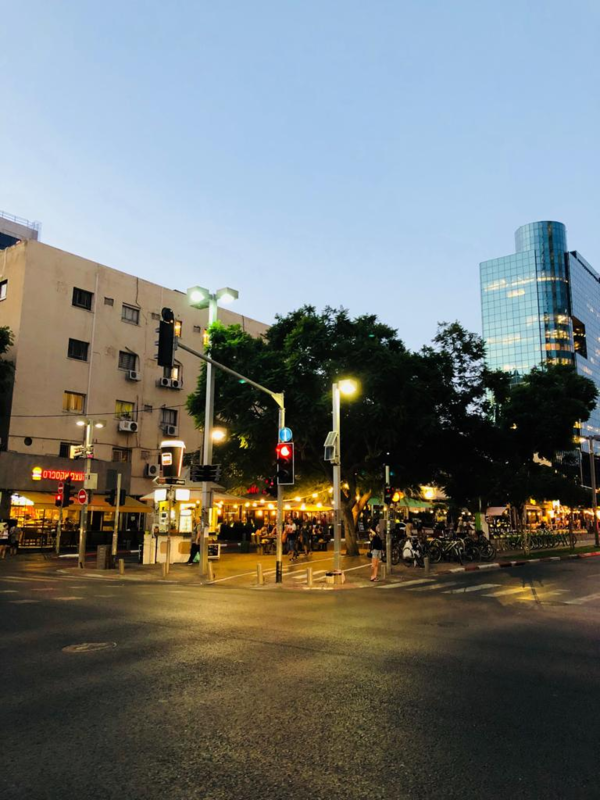 We spent several nights of our last week going out to dinner together at restaurants that make up Tel Aviv’s outstanding food culture. Our personal favorite is called Benedict’s and it’s located just a five-minute walk from our apartment. Benedict’s is known all over Israel for their inch thick, fluffy pancakes and their amazing eggs Benedict options. On Saturday night, to finish off our weekend, a large majority of the group all walked there and had breakfast-for-dinner, or “brinner” as Benedict’s calls it, one more time together. 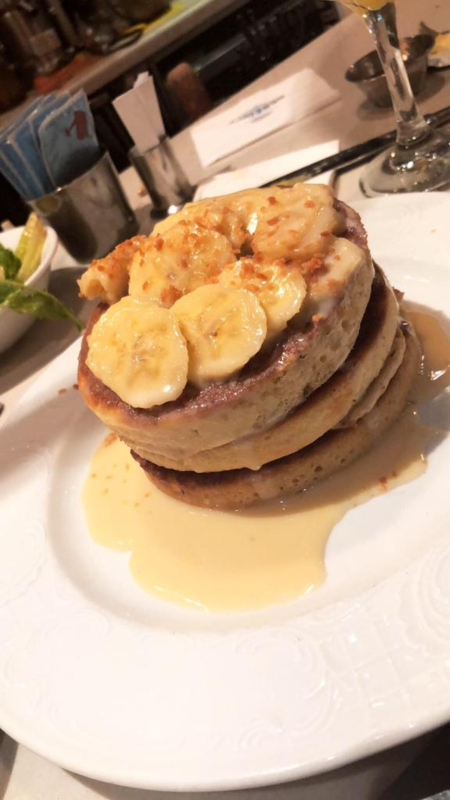 The famous Benedict’s pancakes, in the banana flavor. This week has been bittersweet to say the least. While at times we have all missed Cincinnati, and of course our beloved Skyline Chili, we’ve truly loved spending our summer here and it’s gone by so fast. It’s strange to think that the group has already spent almost our full 8 weeks in here. We have all learned so much as a group, about ourselves, our internships, each other and Israel. This trip has been such a unique opportunity and the memories we’ve made are ones we will all take with us forever. The next few days we will close out our programs with group activities and our favorite beach hang outs before we head back to the U.S. I hope you’ve enjoyed keeping up with us over the last 7 weeks, be sure to check back next week to read one last reflection over our amazing journey.